A phenomenal start to the Championship season from Huddersfield Town saw them sit two points clear at the top of the league going into this weekends round of fixtures. A second consecutive home game saw Wolves come to the John Smith’s Stadium, sitting pretty themselves in third position and on the back of a derby win at Birmingham. This would no doubt be a very tough test for David Wagner’s side, with the away side reinvigorated under new ownership and the new management of ex-Italy goalkeeper Walter Zenga. Town made two changes, including a first start for Kasey Palmer, who replaced Scannell, and a return for last week’s hero Jonathan Hogg, who took the place of Whitehead in front of the back four. As for Wolves, only one of their summer signings featured in the starting line-up, meaning Conor Coady featured for the visitors at right-back. Town, infront of a near-20000 crowd again, started with speed and control, and it took just 6 minutes for the home side to go ahead. Kasey Palmer, on his first start, slipped through Nahki Wells who hit the post, before it was followed up by the on rushing Van la Parra, who fired home the opening goal. What a time to get his first Huddersfield Town goal – against his old club, which he left on less than good terms. He wasted no time in celebrating infront of the travelling Wolves fans, much to their dislike. As for the rest of the first half, Town continued to dominate, with Palmer miscuing a shot wide. As the team’s went in at half time, Town led by the one goal. Wolves very much had the better of the second half, with Doherty forcing a smart save from Danny Ward, before half-time substitute Teixeira struck the post from the edge of the box. Town, despite the pressure from Wolves looked dangerous on the break with Kachunga and Van la Parra offering pace and trickery. The visitors did continue to knock at the door, and thought they’d found a way through following a Bodvarsson header from a corner, only to be denied by an unbelievable one-handed save low down to his left from Danny Ward. This proved to be a decisive moment as the Town fans really got behind the side with 20 minutes to go, and coupled with hard work, the team saw the game out – a 1-0 win. This meant Town stayed two points clear at the top of the Championship, a fabulous turnaround given where the club was 12 months ago. This win also signalled Town’s first clean sheet of the campaign, much to the delight of David Wagner, who ran the length of the field to congratulate Ward at full time. The passion, belief and work-ethic of the manager and everyone at the club has certainly meant there is a feel-good factor around the place – long may it continue. Next up following the international break is a trip to our nearest, and not so dearest rivals, Leeds United. Let’s hope for a repeat of March’s visit. Previous Late Hogg strike sends Town top! 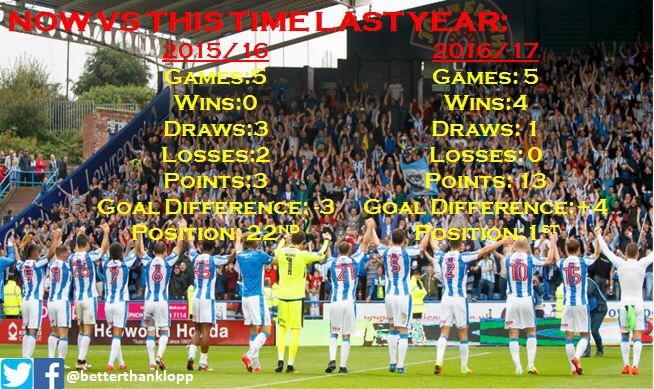 Next Transfer Window: How Huddersfield Town got it RIGHT!